45 million Americans were food insecure last year - according to an Agriculture Department report. This means they had difficulty feeding one or more of their members because they didn't have enough money. That's 14.7 percent of all U.S. households - or about one of every seven. The situation was especially bad for about one-third of the households which reported very low food security. These numbers are higher than in 2008, and represent the highest levels since the government starting keeping track 15 years ago. The report found the households most likely to go hungry included those headed by single parents. Access to food was also worse in big cities and among African-Americans and Hispanics. Out of the 50 states, food insecurity was highest in Arkansas - at nearly 18 percent - and lowest in North Dakota, at close to seven percent. More than 15 million households used food stamps in any given month in 2009 - that's a 20 percent jump from the year before. Rates also rose for the free lunch program and the Supplemental Nutrition Program for Women, Infants and Children. The report also shows the number of households getting emergency food from a food pantry almost doubled between 2007 and 2009. Here’s my question to you: What does it mean when U.S. hunger is at the highest level in 15 years? It means we need to bring jobs back to the U.S. and stop giving our resources out to people who don't belong in this country in the first place. Jack, It simply, although gravely, means that we need to stop spending money on these useless wars overseas and start taking care of our own people for God's sake. Jack, Obviously it means the Bush tax cuts are working. It means we are truly well on our way to being a third world country. My husband is a pediatrician in an urban, low-income area. The biggest problem he sees? Obesity. Doesn't compute. Resources and education are needed on so many levels. Looks to me that we need to be focusing on jobs, jobs, and more jobs. The focus on health care and all the other issues is starting to catch up to our leaders. If people are not making money, they will get hungry. Before America spends another dime on foreign aid, we should make sure all Americans are fed! I don't want to sound cold but what business do we have feeding other countries if we can't even feed our own? I think at least half of us know what it means, who was responsible and why the greatest nation in the world has to be shamed once again with statistics like this. But I'd like to make a suggestion: go out and buy a Thanksgiving turkey and all the fixins. Take that basket of groceries to your local fire house and tell them to give it to some family who really, really needs a break. I guarantee they will know just who to give it to. It means people are poor. It also means politicians have another tool at their disposal to create fear and deliver misinformation disguised as a "cure." I can't wait. It means that the Obama Presidency is failing the people of this country. How can you be the most obese country in the world have hunger? Does that make any sense at all? Go to a window and look out at the people. If your not to high up you will see the vast amount of people are over weight. Then again it might mean that stat includes the illegal immigrants not elligible for food stamps and the hundreds of other programs the American tax payer pays for. It means that all of Obama's entitlement programs aren't working. It tells me that we didn't do a good enough job of throwing the worthless bums out of office in the past election. Maybe if some of them were to be hungry for a few days they would wake up and try doing something that would benefit the American people instead of stuffing their pockets with money from the lobbyist. Get a hint Boehner. I guess the government hasn't found a way to feed all the people in the country as they have been too busy trying to cover them with health care insurance and forcing them to buy it. Will those starving folks be forced to decide whether to spend what little money they have on health care premiums or food? The problem is as old as centuries. If you give a person a fish, you feed him for a day. If you give a person a fishing job, he will eat for life. This country gives away food stamps but has not learned it's primary responsibility is to provide jobs. If there is a job and you don't want to work, then don't complain. It means that we are well on our way to becoming a third world country and unless we stop shipping jobs overseas for more profits we'll see these numbers double in the next 5 years. No surprise there. With unemployment at an all time high, businesses unwilling to hire the unemployed, cutting benefits and pay of employees, the rich getting richer and anti government talking heads screeching across the airwaves, it is any wonder we're in a race to the bottom? When did we stop defining ourselves as citizens first, working in common purpose, caring about one another and working to build a better life for future generations? What does it mean, it means there are no jobs out there that pay enough to afford to feed your family. To reference your question from yesterday, I am sure food stamps is going to be one of the first things on the chopping block for our new republican congress. Jack: It means more of the corn crop needs to be sent to feed the hungry, and not to make alcohol to run cars, or maybe more land needs to be put in to use raising food. This nation feeds 1/3 of the worlds population now. All you have to do is go into a grocery store in Latin America to see all the American food there. Is it right that US farners get paid money from the government for not producing food? During the Bush era, the population was ignored, jobs, education, etc. for phony wars so his rich friends would get more wealthy. The people are cannon fodder for the sake of big business. Bush may agree with Marie Antoinette, "let them eat cake"
It means that more people are going to bed hungry for having to pay more taxes so the rich can get an extra $50,000 – 100,000 or so in tax breaks. What a wonderful country we live in!!! Who the heck thinks up these questions??? Looks to me that we need to be focusing on jobs, jobs, and more jobs. The focus on healthcare and all the other issues are starting to catch up to our leaders. If people are not making money they will get hungry. It means it was this bad 15 years ago . Who was in power then? A strong work ethic seems lacking for all the wrong reasons and hunger is simply a reflection of that failure. One more eidence that we are on the road to second rate with a third world distribution of income – extremely rich and poor. Jack it means there are a lot of people out there suffering than since the great depression. It means charity should start at home first. It means that our gov't has to find ways to get these people back to work. It also means that you will see a lot less politicians helping to serve thanksgiving dinner to the poor because the election is over. Jack: The hunger issue now means the rich are getting richer. Maybe it's time these people learned how to grow food. Maybe the Government can find some land that isn't in use and people can work it up and plant some beans and potatoes. That's how my parents did it. They didn't have a big Welfare Program to fall back on. Jack, before we all get misty eyed over these so called "hunger" statistics, stop and consider that 90% of these poor starving folks probably have the latest Nike glitz adorning their family members and iPod contraptions galore, not to mention the latest cell phones wall to wall. Some cultures have them, some will never submit. For the same reason this message will not be allowed to air, the media will never approach or tell the truth on this subject. It means unless those who fantasize business will provide enough jobs so the three hundred or so millions of American's have decent food on the table, hunger will rise. Again the government will try help the needy, but the party of "NO" will fight to provide the bare necessities of the American public. It means that the middle class is, indeed, quickly disappearing – thanks to self-serving bureaucrats, particularly the refuse-niks, who seem intent on playing virtual government instead of truly serving the people. The clear message to them is, "Read my lips: you're out in 2012!" I think at least half of us know what it means, who was responsible and why the greatest nation in the world has to be shamed once again with statistics like this. But I’d like to make a suggestion: Rather than contribute to a charity where at best only 10-50 cents of your dollar gets to the intended recipients (most of the remainder goes to the charity itself), go out and buy a Thanksgiving turkey and all the fixin’s. Take that basket of groceries to your local fire house and tell them to give it to some family who really, really needs a break. I guarantee they will know just who to give it to. That way you can be sure that ALL of it gets to people you want to help. And the best part is that you will feel great, especially if you do it anonymously. It means that the Santcuary Cities have spent so much on food for illegal aliens, who then left, that legal residents, including children, now have to do without. Share Ameica has gone bankrupt because of the bad checks they received. It means most Americans still can't manage their money, because a cup of Ramen costs 10 cents. Sure, it's not the healthiest thing in the world, but it beats nothing. There's no excuse for anyone with basic money managing skills to ever go hungry in this country. It really means that our "leaders" priorities are all turned around. This whole mess boils down to one thing, work, jobs! Your survey said! 45 million Americans are having a hard time feeding their families or themselves, and that doesn't include their other bills and expenses. Our unemployment rate is close to that number. So if we were working, then we wouldn't be in that bad of shape. Were these numbers this bad 10 yrs ago?, 15 yrs, 20 yrs? No, this is all very recent, all within the last eight years or so. Just when the U.S corporations started sending jobs overseas. Of course, no correlation. Jack: I grew up in poverty and hunger. Society told me I wasn't poor and jungry– I was needy. Then they told me it was self-defeating to think of myself as needy- I was deprived. (Oh not deprived but rather underprivileged.) Then they told me that underprivileged was overused. I was disadvantaged. I still don't have a dime and hungry. But I have a great vocabulary. As a nation, we are not concerned with the poor and the hungry. And in reading your article, they are only to be approached by the statistician or the jouranlist–without resolve. What it means to me, is that all of those celebrities, who are going off shore, with their efforts in philanthropy, are ignoring all the very needy people in the US. Why is it, that when those who can afford to help others, refuse to help Americans????? Very simple, face facts, we are a third world nation who cares far more about its military might than its own people; not fiction, just plain fact, sorry but we need to get used to this and start demanding that politicians get off their fat lazy back sides and actually do something about it; in particular the Senate. I'm sure glad Republicans were running things the first part of the decade. To me this is a clear sign how the wealth in the nation is increasing going into the pockets of the wealthy. There is an ever growing gap in the economic classes and these reports are proof of the after effects. Until someone has the courage to stand up to the almighty rich and drop the Bush tax cuts, then these are the types of things we just have to live with. It means that while everyone wants a balanced budget and is against the idea of big government swooping in to help in times of need, people are still going to have their hands out looking for help. It means that people want the cake and would like to eat it too, no pun intended. And its not just food stamps...its healthcare, its financial reforms...its everything we just voted to change. We are a messed up people Jack. Please help put us back on the straight and narrow! There are no soup kitchens on Wall Street or Pennsylvania Ave. Thats where the TARP money was spent. They couldn't stop the depression so they did the next best thing and isolate themselves in taxpayer money. The TARP and Recovery Money are doing just as they were intended. They perpetuate the wealthy from the correction that would save us all. Instead more and more people enter the door to poverty at increasing rates since 2007. Very similar to the 1930"s when each year was thought to be the turn around that never came. Jack,it means people need to stop being so choosey while hunting for a job,it also means lazy people have learned to depend on government for a handout instead of a hand up! Means that a lot of people in America sleep with an empty stomach. And while the Government is making huge cuts in spending, more people turn to their State for food stamps, and charitable organizations. It means more regulations are needed to bring prices down, and force companies to hire locally. It means that not enough people are eating the rich. It means we need to bring jobs back to the U.S. and stop giving our resources out to people that don't belong in the country in the first place. Interesting, the State with the highest food insecurity is Arkansas, the home of Walmart, the largest business in the U.S. But then maybe that's to be expected, Walmart, whose business practices do nothing to help the country, shouldn't be expected to do anything to help the economy of Arkansas. Walmart, the black hole of American business. Simple Jack. It means that the divide between the rich and the poor is growing. When you remove government controls meant to level the playing field so that everyone has an equal chance of making a decent living, you get a dog eat dog world where the rich get richer and the poor get poorer. Its bad, but what's worse is that it won't get any better. Lets face it, if the government is slashes as the tea party wants, government workers will be in line for these food programs, which themselves will likely be cut. When I was a kid I saw of starving children in Ethiopia, pretty soon we'll be seeing the same scenes shot in the deep south. Have we no poor houses? Are they no prisons? What have these slackers done for the hard working Americans making over $250,000/year lately? The hungry need to take responsibility for themselves and go out and make a decent living instead of whining about it. That is unless you happen to have a heart, an ounce of intelligence, and want to feel good about yourself more than you want a balanced budget. It means we better bring our jobs back home so our people have jobs so they can take care of their families. We are fast heading for a Third World country. We have only our leaders in Washington to blame for this republins and democrats alike because they went along with the outsourcing of our jobs. They care more about big business and their profits than the citizens of this nation. These trade agreements are killing our country. It is time to start a Buy American. If it isn't made here don't buy it. If more people did that we would have jobs so people can feed their families. Jack, it means America, as we who knew it and grew up during the 30', 40's, 50's and early 60's has lost its' senses of "American Community". We are becoming a nation of I, I, I and Me Me Me; self focused and "what's in it for me" to a fault. Forget thy neighbor; I mean it is what their political and economic persuasion is that REALLY counts. As for those who hunger, they can get a job, food stamps or stand in line at some entitlement program our taxes fund. Their hunger has nothing to do with ME... DOES IT? Come to think of it, I miss being a good friend and neighbor and a genuine member of the "American Community"
Welfare for the poor equals Democrat/liberal/socialist. Welfare for the rich equals Republican/conservative/teabagger. It's up to America to vote on who gets the cash and as of late the rich are winning. The government has already taken away an entitlement for many people-eating. It means the middle class and below all need jobs, raises, cost of living increases, etc. unless Food Stamps become the norm. It means the wealthy have not yet confiscated all the wealth. If so many people are doing without adequate food, why are so many "poor" people that are on welfare and food stamps fat? People in this country don't know what constitutes "poor". People need to educate themselves concerning America's history. I would suggest that the "poor" people get off of their collective asses and do something to improve their state in life. Also, they need to quit having children they cannot afford! Wonder why the Bible states that in the last days a loaf of bread will be the same as a day's wages? It means that our obese society needs more and more food to feel "satisfied", Jack. That's it. There is just as much access to food today as there ever has been and don't try to convince me otherwise. Now where did I put that drumstick? Food insecurity? Great. Another politically correct buzzword. Rubbish. The word is hunger. The systematic destruction of capitalism and self-reliance by Progressive governance has created the hungry class. What this hunger problem evidences is that socialism/re-distribution over the last 50 years has created a monster. Beware: Hungry people with nothing to lose make the fiercest warriors. It means that those 8 years under the previous administration adversely harmed this country on multiple levels and multiple fronts. History will show that this country suffered the greatest unnecessary loss of lives and treasury under the Bush administration. People are just getting feed up with Governmment as a whole when they should be angry at the 8 years of Bush leadership or lack thereof.. It is hard to admit but the percent will only grow and grow unless someone can really get some jobs out there. In Texas a waiter makes only $2.18 and all the tips they can get. No wonder most of them are from south of the border. The sad thing Jack $2.18 an hour is Texas law and few get more. As for tips Texas is no Philladelphia. Before America spends another dime on foreign aid we should make sure all Americans are fed! I don't want to sound cold but what buisness do we have feeding other countrys if we can't even feed our own. It means that, as a nation, we are more concerned about profit than we are about poverty. And the next Republican surge will make it even worse, you can be sure of that. Well, it means we need a new policy of course. Follow my logic. "Food Insecure" equates to "Food Poor". So, it would follow that some people are "Food Rich". People who are too heavy for instance. It seems reasonable that we should take food from the fat folks and give it to the skinny folks. In fact, let's just say the top 2% of all the fat people in this country, or at least anyone over 250 pounds should give a portion of their food to the government. The government can divy it up and re-distribute it to those in need of food. Those greedy 250 pounders don't need all that food anyway. The government will be a much better judge of who should eat all the food. It means that our capitalist economic & our corporate-sponsored plutocratic political systems do not work for the common good. These systems serve to enrich the few (the idle rich) at the expense of the many (the working people). This country is now a failed state and a third-world banana republic. Couple growing U.S. hunger with the fact that the rich bailed-out corporations are sitting on billions rather than hiring and that a maority of congress people are millionaires, and it means we as a nation have failed. It means we would rather play politics with the poor in other countries by pretending we care about them more than we do about our own poor and hungry by spending our tax money on them rather than ours. It means we would rather spend money on weapons of mass destruction than feed our hungry. I could go on but what it boils down to is, we choose to not care for our own even when able for many ignoble, greedy and contrived reasons rather than the good of the country. It means the foundaiton of our country, which is work, make money, spend money is not working correctly. Since our unemployment is so high, people can not even buy food let alone housing. This is disgusting – the greatest nation on the planet and we can't get this figured out without spending billions on nothing that has helped. Lose you job, lose your house, lose you appetitie! It Means People Are Hungry And Can't Afford Food So They Have To Go Get Food Stamps, Go Get Food Pantry Orders Or Even Beg Churches For Food! It means that food inflation is at a high level. Just go into a grocery store and amaze yourself at the high prices. The gov't says there is very little inflation to speak off. Too bad they do not include food prices. What all of this means is that the USA is looking more and more like a third world country. Also, printing more money out of thin air, QE2, only makes commodity prices go higher. Food is a commodity of many types. Wheat, corn, sugar, soybeans, vegetable oil, coffee, etc. All of these things are at high prices and this is because of the quantative easing that the Fed is doing. Too many people on the latest diet fad. It means that the very rich have most of the wealth. Many of us will die for lack of health care or food. It matters not to the rich just so we don't cost any money they plan for themselves. It means they will have to stay hungry. Congress is busy grilling the TSA over pat downs & body scans. I would say that it is probably tied to unemployment. No work, means less food, and less food means people are hungry. We need to educated our country, then they have a better chance of providing for themselves. It means America is well on its way to revisiting the middle ages, when there was obscene wealth at one end of the spectrum, abject poverty and hunger at the other, and very little in the way of a middle class in between. Some would say I'm promoting class warfare, but that war has already begun, and the rich are not losing. It means that our Congress needs to act with expediency and urgency to improve econonic conditions in the US. All this BS talk that has gone on with the newly elected officials is disheartening. Most of the Congress has no idea just bad things are out there on the streets–and many don't care. It means Purina needs to get busy and invent "people food". What have these slackers done for the hard working Americans making over $250,000/year lately? The hungry need to take responsibility for themselves and go out and make a decent living instead of whining about it. That is unless you happen to have a heart, an ounce of intelligence, and want to feel good about yourself more than you want a balanced budget. Anyone surprised? People without health insurance have moved from 45 to 50 millionin the last year, the rich to poor gap has expanded almost every year recently. The "rich" now have the lowest Maximum income tax rate in the history of the US.....35%...(it was LOWERED to 50% by Ronald Reagan). The rich have taken advantage of a 45% increase in stock values since Obama came into office, and are now whining that they may have to go back to the 2nd lowest maximum federal tax rate in US history )39.6%.....If you are poor in the US, you are in trouble, and it will get worse now that the GOP leads the house...i.e. eliminate welfare, food stamps, extended unemployment, expanded health care coverage etc. The suicide rate will be going up soon. Jack, This is crazy!! America produces the most food of any country in the world and we have hunger?? It does not make sense!! This social phenomenon means that America does not care about people and values profits over people. We claim to be the most charitable country on the face of the planet. I think that charity begins at home and that we should start that charity by taking care of our people. knowing hunger very well coming from a family of 16 children, dad was a coal miner. when my wife and were dating and decided to marry we both decided to only have 2 kids . she came from the same environment i came from. theres a old adage that still applies today 'IF YOU CAN`T FEED EM, DON`T BREED EM!!! two comments here. IF YOU CANT FEED EM, DONT BREED EM. lack of a decent education, job outsourcing says it all!! It means that we should let the Bush tax cuts on people who make billions of dollars in a single year expire, bump up the rates for anybody making over a million, and give people more food stamps temporarily. Food Stamps give the best bang for the buck to stimulate the economy, and all that money will work it's way back up into the hands of the very wealthy anyway. It's sickening that we let people go hungry in the wealthiest country in the world. It means we are not doing a good job as a society. Given the economic times, is it any wonder that this is a problem? However, having traveled all over the world, hunger and poverty in the US is nothing like it is in other parts of the world. Not that the US should not and cannot do better, but people who get wound up about this in the US really need to see the problem as it exists in the rest of the world. I find that we in the US have a very skewed viewed of hunger and poverty here when it is millions of times worse elsewhere in the world. It means that things are bad and about to get worse for working Americans, and Americans who want to work. It also means that the wealthy are getting wealthier. I don't undersatnd studies like this. Where is the evidence of all of this hunger? People are more obese than ever, especially those considered poor. No one is dying on the streets of malnutrition in this country. There are more people than ever on Food Stamps, WICand other programs designed to curb hunger. Plus, food prices have not risen that significantly in recent years. This doesn't make much sense. For the rest of us, may I recommend a 5 lb. bag of Friskies Turkey and Gravy. It means that in our country something like 10% of the people have something like 90% of the money! It also means that hunger anxiety is a great way to control the population. And we are so much like sheep that even if it escalates to being STARVATION anxiety, we will probably still swallow whatever pap the powers-that-be deign to feed us. That people are spending they "disposable" income on cell phone service and iTunes instead of lunch or dinner. It means the recession is not over at least for the poor. The gap between the rich and the poor is getting wider. Big business loves this, because when people are hungry they will work less. It means we should be calling this a depression, but the media and our illustrious elected officials are pulling one over on us. But on the good news front, Wall Street Banksters will hand out billions in bonuses and members of Congress have seen their wealth increase. Those two groups tend to take care of "their own." And how many of those that are "food insecure" have cell phones or an iPod? Many times is priority that is the problem, not the amount of funds. 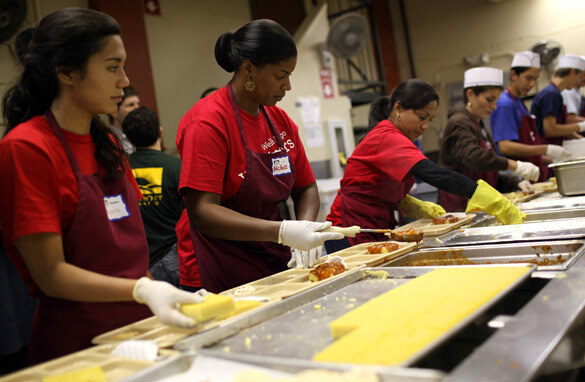 How can U.S. hunger be at it's highest level in 15 years but also have an obesity problem? The lowest level of food security among the masses means simply that the top 1% are eating all the more and all the better. It simply, although gravely, means that we need to stop spending money on these useless wars overseas and start taking care of our own people for God's sake. Well Jack, I guess the obesity rate should be the lowest it's been in 15 years. What do your numbers say? Hunger is a problem and during the holidays it should be adressed and reduced. I found myself in a more charitable mood during the holiday season. Hopefully others will reach out and donate some time and/or money to help others. This means that overall morale that fosters the drive to eat in the US is waning in direct relation to worries about the stagnant and poor economic situation. Health problems will soar as this economy continues to go downhill. The worst is yet to come. It means we are are spending way too much money on thord world countries who don't like us much anyway. I say cease all foreign aid and spend that money here at home. My husband's a Pediatrician in an urban low-income area, the biggest problem he sees? Obesity. Doesn't compute. Resources and education needed on so many levels. It means that our government has ruined the American Dream. We used to hope to one day have the nice big house with the white picket fence. Now we pray for 3 squares a day. Our Unions are broken. Our entreprenuers have been gutted. Our Jobs are overseas. Its not looking Good Jack! It means those Americans are dysfunctionally short on money. It means that there are more people putting a strain on the economy by taking advantage of the handouts that the government continues to give. Instead I think that those on welfare and food stamp programs should be required to compensate for what they receive in non-monetary mediums, such as community service. I think that it shows that despite the United State's wealth and power we are unable to do a thing that almost all industrialized nations can do, take care of their poor. Those in need have grown over the years because of our neglect of the problem. We need to have a more comprehensible plan of pulling people out of poverty and providing for their basic needs. It needs to be a goal of Independents, Dems, and Republicans, and most importanly the people. It means that every one of us should give thanks this Thanksgiving, for our compassionate government. Cut funding for programs to feed the poor and give that money to the rich - it won't work, but that's the answer to all our problems nowadays. This is a very sad and disturbing situation in America. This is why I am directing virtually all of my contributions to local food banks and charities as opposed to sending my support to far away causes that may not get the intended result. It means that trickle down economics isn't working for 45 million people in this country. Jack, "hunger at the highest levels in 15 years??" It means the republicans have been hard at work, and that the chicken-hearted cynical dems have laid down again for fear of doing anything helpful, useful, sensible or decent for which the republicans might call them "liberal." Most of us will pay for the various bush doctrines; carelessness, thoughtlessness and selfishness for a long, long time. It means that we should end two wars, stop sending billions to other countries and start taking care of our own people! It means that tonight, as my wife and I put yet another hole in our belts in order to keep our drawers up, that we see that there might be a different purpose to the kids who have been wearing them around their knees. We may be doing the same thing soon as well. This is from single parents who may have produced children from several partners whith they never married. They probably get assistance from both state and federal government in the form of food stanps or a pre-loaded debit card. If the truth is known, poor decisions are made when this assistance is utilized. I am not sure I can buy into your %. It means GREED is alive and well in this country Jack. The top one percent are now taking in twenty-three percent of the annual income in the United States. The more income going to the wealthy MEANS less income to the poor and middle class. The wealthy have manipulated the system so well, they DO NOT need slavery, serfdoms or dictatorships to rule economies anymore! many of those receiving benefits are putting wants ahead of need. How many of these households have cell phones, internet and cable TV? Needs should be taken care of before wants. Food and shelter first. However, our wants now come first and we expect the government to take care of our needs. It blurs the number of how many really need help. It's obscene that we have this level of hunger and need and politicians are even debating to extend unneeded tax cuts for the wealthiest and best fed in our society. Even more obscene, given the debate as I have watched it reported, most people (including Democrats) don't seem to care and are willing to add at least $700 billion to our deficit. I am disgusted. This is really no surprise after being under Republican rule for 8 years. The trickle down effect trickles right down into the rich man's pockets and stays there. Seriously, do you think that a rich person sits down at his dining room table to a big dinner and even thinks about neighbors in his own town who are going without food? No, because they think they "are not their brother's keeper." In the words of Jesus, "He that has done it unto the least of these people, has done it unto me." i wonder how we can call ourselves the greatest country on earth when we have 45 million fellow americans, many of them children, going hungry each and every day? How can we call ourselves the greatest country in the world when we are ranked in 151st place for childhood mortality and in 37th place for healthcare for our citizens? It is so very sad. What do you expect Jack? You and your Tea party friends have cried and cried about the government helping people. You've talked about the redistribution of wealth as though it was a dirty word. The republicans and the tea party believe that people should get off their backsides and make their own way. They won't be happy till we are back in the days of Charles Dickens and people are in workhouses and debtor prisons. People need to help others and the government should help those who can't help themselves. If the republicans have their way that 15 million number should rise as the rich get richer. What does hungry homes at the highest level in 15 years mean? It means that there is too much food going into big fat gas tanks! It means Capitalism is working. The greedy get richer, the middle class is shrinking, the poor class is going to increase. A report can be made to fit whatever position you want, it can tear at the heart such as this one or it can infuriate the tax payer. California had to pass a law restricting recipients from abusing the intent of the program. Here is where the cards were being used and subsequently had to be legislated to put a stop to it: medical marijuana shops, psychic readers and massage parlors, among other businesses. We need to make sure the money given is used as intended. If you need help buying food, that food should not be soda, chips or other snacks; it should match the food pyramid. We have gone from providing a hand up to people in bad times to generational dependency which is now considered an entitlement. Heck, just last week CNN had a report when they talked about welfare recipients retiring into the social security program, seriously? I wish someone with economics understanding would speak up. The working class needs the money not the rich. We must be able to buy the product before you produce it. We need our homes to shelter us and food to feed us. The AIGs only pay our money to those which do not need it. If we can not afford the product we will not buy there it will not be produced. Jack, "hunger at the highest levels in 15 years??" It means that the republicans have been hard at work, and that the chicken-hearted, cynical dems have once again laid down, refused to fight, and failed to do anything sensible, helpful or decent for fear the republicans might call them "liberal." Most of us will pay for the various bush doctrines; selfishness, carelessness, and thoughtlessness for a long, long time. It means the republicans/Wall st needs to get serious about the survival of our country. And, if they discontinue benefits for the unemployed the number will grow. to help us and our country. How can anyone doubt where their priorities are?? Thank you for asking this question. This should always be foremost on voters minds. Health care for these and more people will again become equally important if many of the newly elected get their way. The sentiment in the last election was to increase this problem. It means that after the last election, most Americans should feel terribly ashamed of themselves. Instead they seem to be congratulating themselves without limit for making the rich even richer. The lower cost foods are in a large part the food with higher amounts of fat. You ever read the fat content in the lower priced hamburger meat? Jack, That is pretty bad when are supposed to be one of the riches nations in the world. Maybe we are really one of the poores nations in the world. It looks like those number tell us that the rich are getting richer and the poor are getting poorer. It means low and middle class America has been raped by government and corporate America. And it's still business as usual.. They vote for the rich who make hollow promises just to get the vote. Sooner or later "we the people" are going to have to say no more. Cancel health insurance barter with the doctor, so we can feed are families. And afford to have a roof over our heads. It's time to say no more to government and corporate America. And do with less. Why are we looking at (and accepting) our elected officials giving a tax break to the super-wealthy when regular Americans are struggling like this? We aught to be ashamed of ourselves! All the studies show that children with insufficient nutrition do worse at school. We are going to have a large part of a generation with no way out of poverty and no hope. That will be our legacy and our shame. Someone, somewhere, needs to tell the truth (for once) and jerk us all out of our comfort zones and call us on the travesty!! Cafferty, my vote is on you...thanks for this piece...and keep up the conversation! 5.7% of people in US households experienced "severe food insecure". Is this huner? No. According to USDA definition–"severe food insecurity" means at least once in preceeding year at leats one person may have experienced reduced food intake. As anyone who has ever spent time in a poor part of the world knows, this is NOT hunger. In US, there has been virtually no hunger in any meaningful statistical sense for maybe 40 years. "Food insecurity" is an artificial concept invented by a governmenet agency in search of a "problem" to justify it's existence. It means that trickle down economy policy has truly failed. The rich are secure and hoarding what they have. The middle class, critical to democracy, is shrinking. We will soon have only 2 classes of wealth in this country and mirror what we wanted to declare independence from at the start of this great experiment. We have become too dependent upon commercial resources to feed us and never are curious about how they grow and produce our food. It's so simple. All our jobs are in China! It means the concentration of wealth is reaching epic proportions and that top 1% should be very worried. When it reaches 20% those that live in the gated communities may just find themselves becoming food on the table of the rest of us. Having worked the street for 20 years as a Medic I've seen both extremes of the socio economic scale where people in general lack priority. If even half the data is accurate, having children go hungry in the 'Greatest Nation in the World' suggests we as a country need to re-examine our priorities.. It means the richest in this country need a tax cut so they can create jobs for the unemployed and under employed...really? It's worked so well for the last 10 years...hasn't it? This is really shameful! And these idiots we have running the country are playing political games with unemployment insurance. Am I sleeping and having a nightmare. Someone shake me and wake me up because I'm afraid. Unemployment. Unless people are willing to move to where jobs are nothing is ever going to change. Some jobs are never going to come back, so people have to re-educate themselves. While food banks are meant to be a temporary solution, some people have made it a way of life. getting there acrylic nails done on a regular basis. US Govt. has spent trillions (transfer of wealth) in the so-called war on poverty and we have more poor people...hmmm? This is clearly a failed model and it does not take a genius to understand that making it easy to be poor and unproductive means more people will be poor and unproductive. Why are you surprised? The 8 years of damage the Republicans did to the economy so that it almost collapsed? Of course people are going to go hungry. Some Republican Governors would not even help with extensions on unemployment when it was most needed. I can not take all of this surprise about how badly the poor and the newly poor are doing. It will take years and years to recover, if we do at all. More than half of Americans are obese. If they gave up just 10% of their glutinous intake a day to those who really need it, that would go a long way to solving the hunger problem. It means that America is on the slide. We can still turn the tide if and only if the media and the politician will start doing what is right. And we the people start supporting the right people not simply because they are on our side in whatever form. The media especially have to start asking the right and tough questions instead of shoving what the unpopular Sarah Palin said down our throat. Just imagine how the rich is trying to convince the rest of the country to cut tax for them and they have almost succeeded using the media. Pathetic, isn't it? It means Globalization is hostile to the American citizenry. When you ship jobs overseas citizens are unemployed....and hungry. Why don't all these poor people just pull themselves up by their bootstraps and become CEOs? Then they wouldn't be hungry anymore. Problem solved, in Teabag America. Thank you for a non-political and critical issue that exposes the core of the national leadership....neglect. It is a disgrace. The government pays farmers not to plant and is always sending supplies overseas to other countries while our own people go hungry. This is the mess that has been made out of this fine country over the last ten years. Let the politicans start listening to the old adage:Charity begins at Home! It means were feeding to many illegal aliens while legal Americans are going hungry . It's been this way for at least 10 years. It isn't something Obama has done. It is the Bush pre depression mess. The right do not care if the needy go hungry, homeless or sick. They only worry about the tax cuts for the rich, spewing hate, and padding their pockets.